Basic mechanism of sleeve ejector is how to make insert pin doesn’t move when sleeve ejector move to eject the product. 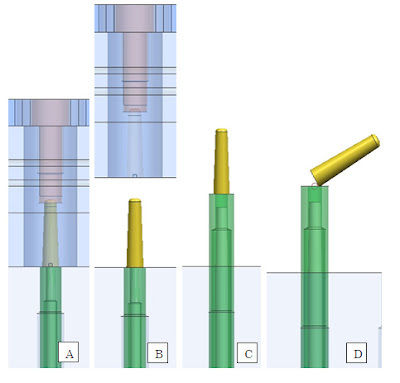 Picture above shown step by step when sleeve ejector moving to eject part, the main part on those picture are product (yellow) sleeve ejector (green), core insert pin (white at center of sleeve ejector) mold base core (light blue at side sleeve core), cavity insert (dark blue), cavity pin insert (pink at center of dark blue), and cavity mold base (light blue surrounding cavity insert pin. A. After plastic material injected at cavity insert then cooling water/liquid will flow to transfer heat from mold to liquid. At this position mold base still close, just seconds before ejecting process begin. B. Ejecting process begin, first mold will open, core insert include cavity insert will move to backward, because shrinkage of material always move to inner side, product will stick in core insert pin. 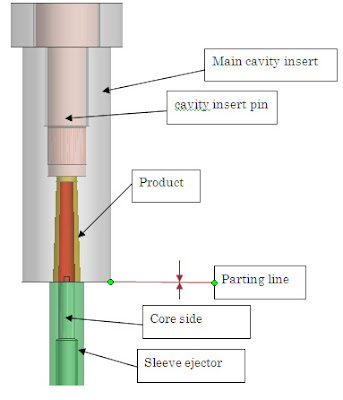 C. Sleeve core move forward when ejecting process begin, sleeve core will eject the product, and the product will leave core insert pin, because core insert pin doesn’t move forward. After sleeve core move same as ejector stroke, product will drop, and.. Gotcha.. you get the product.